In its golden jubilee year, IITA completed its strategic planning process and organizational restructuring to offer effective and efficient services for transforming agriculture in the continent. However, transformation of African agriculture has paramount challenges due to the social and physical diversity of the continent. This necessitates comprehensive approaches and customized strategies for increasing the use of technologies and achieving agricultural transformation. Such approaches and strategies cannot be achieved using existing innovation delivery approaches, which are based on high standardization and do not use real time data. the component with the least scalability. The research has since been taken up by many more initiatives at the Institute and beyond. In 2017, the team tested the approach and toolkit across all priority countries of the AfDB- funded Technologies for African Agricultural Transformation (TAAT) project. These are Nigeria, Tanzania, and DR Congo. Other countries include Burundi, Ethiopia, Ghana, Uganda as well as countries in other tropical regions such as Bangladesh, Cambodia, and Ecuador under the framework of the CGIAR Research Program on Roots, Tubers and Bananas (RTB). A rapid analysis of the innovation system including profiling stakeholders, innovations, and projects based on their relevance to scalability. Identifying the specific innovations that impede agricultural transformation in the targeted geographical areas. Measuring current scalability of the innovations using evidence. Tracking the improvements in scalability of innovations. 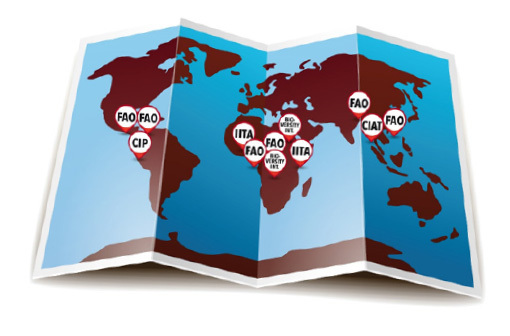 Capacity Development of Agricultural Innovation Systems (CDAIS) led by FAO and AGRINATURE. In April 2017, the ACAI project conducted a baseline survey of the scalability of its components before it started scaling activities. 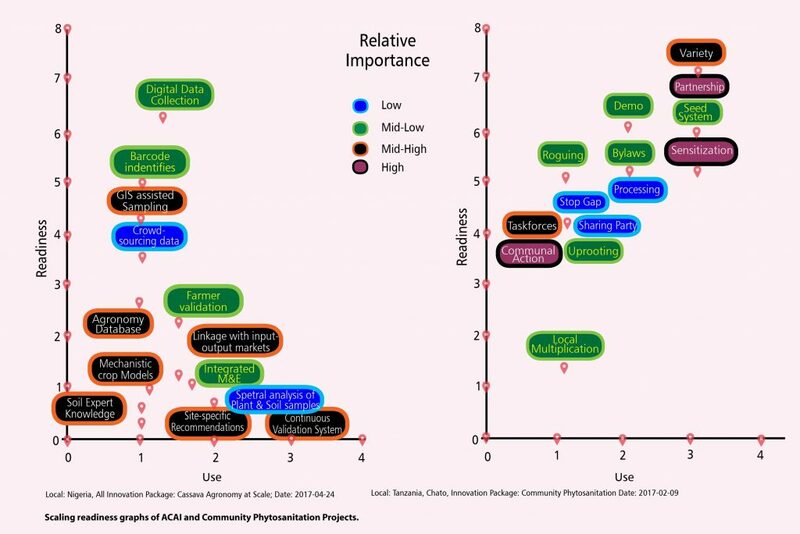 Near the end of the project in February 2017, the Community Phytosanitation project made an endline assessment of the scalability of its components. 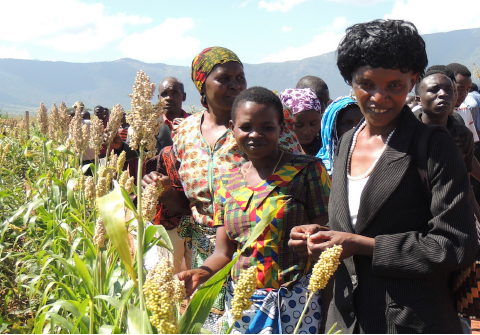 It identified significant progress in the development of variety and partnership arrangement, but the local seed multiplication system was a critical component that hindered the application of the approach at scale. Locations where the Scaling Readiness approach and tools were implemented in 2017. Social network analysis of multistakeholder platforms: Opportunities and constraints for innovation and scaling PLoS ONE 12(2): e0169634. 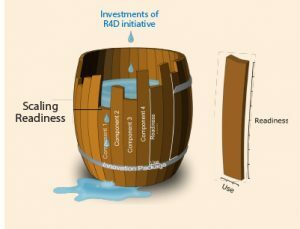 Scaling Readiness generated evidence on the scalability of innovations in the CGIAR portfolio. It presented the scalability of each component of the ACAI and Community Phytosanitation projects and guided them to focus on the challenges that hinder the use of technologies and other innovations at scale. Scaling Readiness aims to provide support to IITA initiatives and provide them with evidence and decision support tools to develop and implement evidence-based scaling strategies. It also aims to use state-of-the-art social science methods, such as social network analysis and content analysis for publishing evidence about scaling the interventions IITA has been coordinating and its contribution to the transformation of African agriculture.